Whether it’s riding or driving the Polaris Slingshot is a blast to take for a cruise. I drove it over 200 miles with friends and family and everyone loved it! I especially enjoyed taking my Pops and my boys Dylan and Gavin for a ride. When I showed up to my older Son’s school to pick him up you should’ve seen the reaction from his friends. They went nuts. It actually gave me a chance to be cool Dad for once. It was also great taking it into the drive thru at In N’ Out Burger. 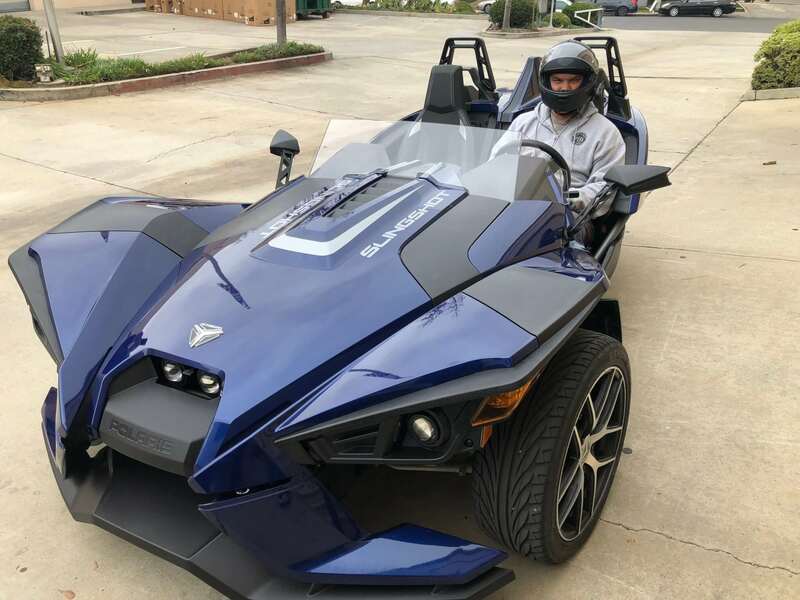 With the Slingshot you need a helmet but not a motorcycle license to drive/ride it in the state of California. It’s a stick shift and a 5 speed transmission. It’s got 173 horsepower and handles the corners pretty well but you better have the traction control engaged or you can get very sloppy in the back end. The specs are mentioned in the video but if you want to find out more or rent one contact Indian Motorcycles Of San Diego. Also, please subscribe to Motorcycle Monkey Channel and share this video with your friends.